This high quality electrode skin pad is perfect for both the relief of pain to the lower back area and treating a wide area with TENS or neuromuscular electrical stimulation. These self-adhering electrode pads feature extended reuse life, strong wire and no residue on the skin for excellent connectivity creating a long lasting reliable electrode pads. 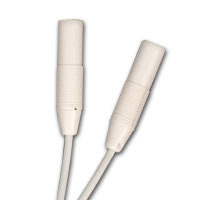 The Lower Back Electrode Pad is for use with all types of TENS or EMS electrical simulators. The large surface area of the long electrode pad gives a much larger area of pain relief that can be targeted to the lower back or to stimulate those hard to exercise pelvic floor muscles. Buying a higher quality electrode pad means they last longer and your unit works better providing you with outstanding results. TENS pain relief and neuromuscular electrical stimulation through skin elecrode pads.